MegaTraveller (1987) plunged the Imperium into civil war, and The New Era (1992) pushed it to complete collapse. Today each version still has loyal fans, and there have been more third-party products than the Imperium has tramp freighters. Leaving aside the various open game licenses popular today, Traveller (along with Call of Cthulhu) has been licensed to more different publishers than any other major RPG system or setting since the earliest D&D days. "People have always wanted to participate in Traveller as a product," says Miller. "Its coherent background cried out for many, many products, and there were always people who had great ideas." The game company FASA started as a Traveller licensee before publishing hits like Battletech and Shadowrun. The Mongoose Publishing edition of Traveller is the company's best-selling game; Mongoose has adapted its rules to support both the Imperium and many other science fiction settings. Traveller's largest presence on today's store shelves may be the full-scale support line, edited by Wiseman, for GURPS from Steve Jackson Games; these books describe an alternate timeline where the Imperium never fell. In computer games, Traveller's influence starts with Elite. The 1984 space trading classic owes an obvious, if uncredited, debt to Traveller. Elite in turn shaped Privateer, Freelancer and other star-trading games down to EVE Online. 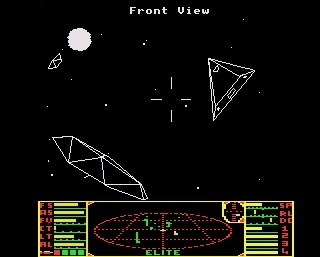 "I still have conversations with people who played that game [Elite], enjoyed it, and believed that it was a Traveller clone," Miller says. "In a sense they are wrong: Both Elite and Traveller describe play of a more universal concept of space adventure. But in a sense, they are right: It's hard to believe that the program's designers didn't have a set of little black books open on their desk for inspiration as they were designing the system." Especially when you realize "Jameson," the hero of Elite, is also the name of the sample character in Classic Traveller's example of character creation.